We love it when our plants begin to blossom; the beautiful colors and fragrance in the air. It’s amazing! Until they stop…now what? Deadheading your plants is the answer to help you get the most out of your flowers throughout the growing season. For some gardeners, deadheading is a mundane chore. For others, it is well worth the effort. At Lomond View Nursery, we are the “others” that consider deadheading well worth it. Deadheading is a necessary task to help invigorate our flowers keep them healthy, happy, and blooming from our nursery to your home. Many landscapers and nursery growers believe that perennial deadheading is the backbone of gardening. Cutting off “fleshy” parts of the plant; usually blossoms, that are dead or dying. Deadheading tricks the plant. Naturally, flowers produce a bloom, go to seed, then die or go dormant until next season. Deadheading tricks the plant into thinking that it needs to produce more flowers so it will have seeds for the next season. This helps keep flowers blooming several times in a season instead of just once or twice. How do you Deadhead Flowers? There are two different ways to Deadhead. First, you can pinch blooms off with your fingers. This is an effective method for small flowers; especially for annual plants. Pinch below the base of the flower. Second, you can use garden tools. Garden shears or pruners are best, you could even use regular scissors. Remember that plants have particular needs and are all different. Cut back at the s tem near the healthiest leaf axil. Cut back clear to the ground. Cutting the stem, right above the foliage. Ask a Lomond View expert if you have any questions about where to deadhead a certain plant. Annuals: The focus for annuals is to flower as much as possible. An annual’s blooms fall off easily when spent (dead/dry). Some newer varieties of annuals are sterile. Meaning that they do not produce any seeds and will continue to flower all season long until the plant is spent. Therefore, it is not necessary to deadhead since they are a continual bloomer, but you can if want a faster bloom. Perennials: A main reason of deadheading a perennial is not only to produce more blooms, but to help keep down those invasive spreading plants. Some perennials, Peonies for example, do not need any deadheading since they will only bloom once a season. Yarrow, has an aggressive nature to spread and grow quickly. If this is the case with any of your perennials, you will need to prune and deadhead. Pruning removes unwanted parts, dead or alive. 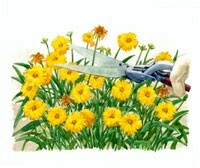 Deadheading only removes spent (dead) or close to spent flowers. Ask a Lomond View expert questions on what plants you should and should not deadhead and prune. Not deadheading can have benefits too! Dry flowers could provide an ornamental appeal to them. Dried flowers can provide food for birds and small animals, or compost to the soil for nutrients. For example, coneflower (Echinacea) provides food for birds in the fall season when food is scarce. The choice to or not to dead head is your personal preference. There is no right or wrong.